I feel you, Mr. Goldsmith. The Tiger Saga is one of the more popular and loved series out there so it is with much regret to report that I am not as eager to jump into the bandwagon. This has also been a trend with me lately with the more famous books thus, Mr. Goldsmith’s sentiment. 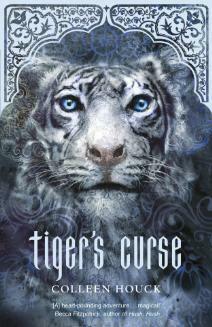 Tiger’s Curse is the type of book that starts out with a strong promise but gradually weakens. The characters were initially bland but they exude the promise of getting better, so I held my breath. Kelsey seems to be the type character that’s weak in the beginning but gets tougher and more mature as she continues to face the hurdles in life. You know the drill. This trope I can live with however, due to the fact that her character is poorly written, I didn’t get to see any remarkable growth in her character at all. If anything, she just became more immature and therefore, annoying. Ren reminded me at first of Kai from Marissa Meyer’s Lunar Chronicles (who’s basically one of my book boyfriends). It was one of the reasons why I thought I was going to like this book. Kai is gentleman and even on paper, he has a smile that can melt a person. Ren is the same. However unlike Kai whose smile I will never get tired of, with Ren, I got full of him by the nth time Kelsey mentioned it. I almost always dislike books that are romance-centric and this is not an exception. Also, insta-romance. This is confirmed in the latter part of the book since Ren was a tiger when Kelsey and him first met, but this is pretty much a given what with the way the story was going. And did I mention love triangle? Honestly, I think it's a poorly thought-out plot device for this book. It is anything but necessary and it only made the plot even more contrived. The third corner of the triangle happens to be Ren's younger brother, Kishan, who's practically the main reason why they both got cursed. Kishan is overly flirty, cocky and confident with a hot body to boot. This is another trope that I can get used to, however it just isn't spontaneous enough for me to buy. Colleen didn't even provide an explanation as to why the brothers are so smitten by Kelsey. There's nothing special about Kelsey except maybe that she smells like "peaches and cream" wait, what? But seriously, I could've ignored it with Ren, but Kishan? And in the first meeting too! The ending is something I didn't see coming and I can see how this frustrates some readers. It frustrated me too but in a way, I understand Kelsey's decision, albeit a grating one it is. Kelsey is very practical and realistic. She knows there's nothing special about her even if she smells like peaches and cream. She doesn't have the wealth or features to boast unlike Ren who can have everything at his disposal. But this also shows how much she lacks self-esteem and this proves how underdeveloped her character is. It gives me hope that she'd be more likable in the next books which I really am hoping to see as I still want to read the sequel since I already have the print copy. Yikes, too bad about this one. I own all of them (and am now kind of regretting it) but didn't know what to expect. I HATE INSTA-LOVE. So, so much. With an extreme passion, as you can probably tell. I'll still give these a try, but definitely lower my expectations a bit. Aww that's why I don't buy a whole set without reading book 1 first unless you got it for a bargained price then I guess it's okay. Anyhow, I hope you enjoy this much better, Alise! Well shoot Chel! You had me thinking this might be a book for me when you mentioned it's romance-centric (because that's always something I enjoy), but then you said the dreaded words "insta-love" and "love triangle" and I kind of wanted to curl up in a fetal ball on start rocking. WHY? Why must there always be a triangle? Sometimes I can look past the insta-love, but I've reached the end of my patience on triangles. I need a break from them:) I'll be interested to see if you like the sequel if you decide to pick it up! Same! There are some insta-loves that I end up liking but love triangle? Psh. So many great series have been destroyed by insta-love, imo. I've never been interested in this series, so it looks like I've avoided a disaster. I hope your next read is much better, Chel!